Here's another long-lost cassette from the "Derg years" in Ethiopia. Bati (Ambassel Music Shop, ca. 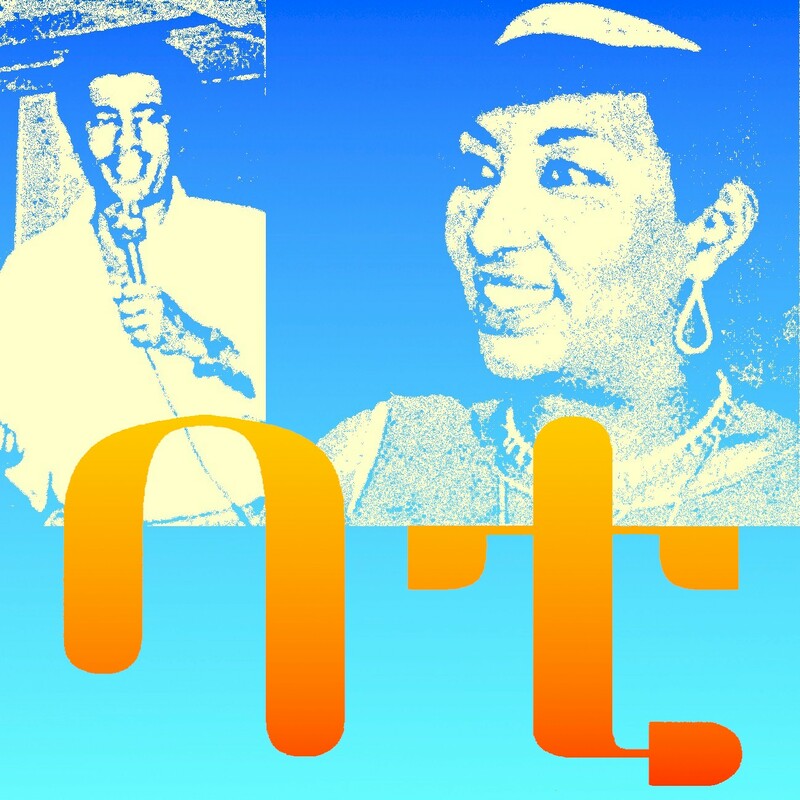 the early '80s), by Rahel Yohannes & Shambel Belayneh, was apparently quite popular in its day, and perfectly illustrates the confluence of the ancient and modern that is so typical of contemporary Ethiopian music. Rahel Yohannes (right) began her career not as a singer but as an entrepreneur. In Addis Ababa she managed a restaurant and often entertained the customers with impromptu a capella vocal performances. This led to her introduction to the late Ketema Mekonnen, a singer and player of traditional musical instruments. A professional career, and ten albums, soon followed. To this day she is both a performer and a restaurateur, entertaining audiences at her Fasika Restaurant & Nightclub in Addis. 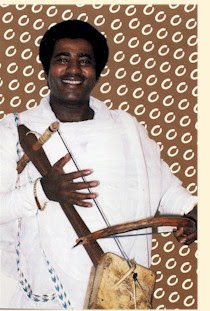 Shambel Belayneh (left) is a master of the Masinko, the traditional one-string Ethiopian violin. He has performed with the greats of Ethiopian music, including Aster Aweke, Mahmoud Ahmed and the Roha Band, among many others. He currently lives in the United States. 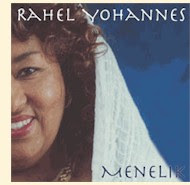 Rahel Yohannes and Shambel Belayneh both have CDs available from AIT Records. 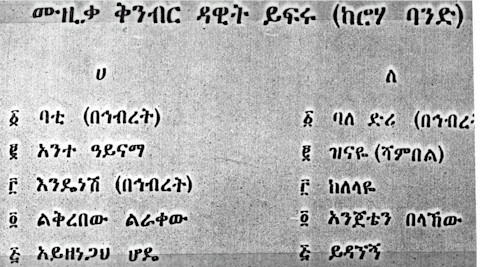 As I discussed in my last post on Ethiopian music, music distribution in Ethiopia during the '80s was a "do-it-yourself" affair, cassettes being duplicated one-by-one by various music shops. Bati is no exception, and it shows in the recording quality. The musical quality is another matter. I'm sure you'll agree with me that this is an outstanding work of art. I want to leave him before he gets what he deserves. Unfortunately I have no idea what the other songs on Bati are about. If anyone out there knows Amharic, I'm sure we'd all like to know. The tracklist on the cassette lists ten tunes in all. The ninth, "Anejetyne Balakewe," is missing. The song titles were transliterated by myself from a photocopy of the cassette inlay card (below) using the Geez syllabary, so I can't vouch for their accuracy. Anyone with a knowledge of Amharic is invited to correct any errors.